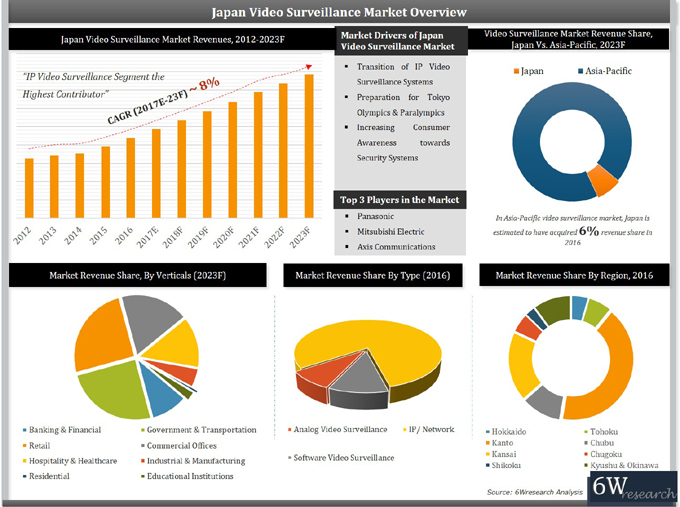 Japan video surveillance market is growing steadily year-over-year owing to growing penetration of IP video surveillance systems in several verticals. In terms of the overall electronics security market, Japan is estimated to have reached $1 billion in 2016, with surveillance segment being the significant market contributor. Additionally, as a result of rise in global terrorism, the Japanese government is heavily investing towards deployment of security systems & devices throughout several public infrastructure areas, predominantly airports, metros and key crowded places. According to 6Wresearch, Japan's video surveillance market is projected to grow at a CAGR of over 8% from 2017 to 2023. Japan is increasingly registering transition of IP video surveillance systems from analog. Japan is witnessing positive growth in various vertical markets primarily across the government & transportation, retail, banking & financial and hospitality. Apart from this, upcoming Tokyo 2020 Olympics and Paralympic games are further adding to the growth of surveillance systems throughout various verticals. In 2016, the retail, government & transportation and hospitality & healthcare verticals held highest share in terms of market revenues, however, other verticals such as commercial offices, banking & financial and residential are considered as key growth verticals. 13.3	Panasonic System Networks Co., Ltd.